Founded in 1919, Building Stone Institute is a non-profit trade association dedicated to serving its member firms while educating consumers on the uses and benefits of natural stone. Cee-Jay Tool Company has been manufacturing fully-hydraulic mobile and stationary stone cutting systems for quarries, stone yards and masons since 1950. 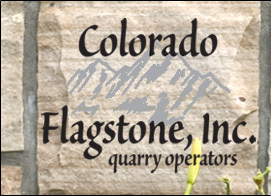 Colorado Flagstone, Inc. specializes in quarrying 'Buff' colored flagstone. If your needs require a 'Red' colored stone, contact O & A stone. O & A Stone's top quality Colorado Red Flagstone quarry is considered to be one of the highest quality quarries in the Lyons, Colorado area. For sixty years, the Marble Institute of America (MIA) has served as the authoritative source of information on standards of natural stone workmanship and practice and the suitable application of natural stone products. Since 1857, the AIA has represented the professional interests of America's architects. The AIA is committed to excellence in design. Colorado Flagstone, Inc. meets all BBB Online Reliability participation and Better Business Bureau membership standards. Colorado Flagstone, Inc. is a member of the US Green Building Council.